It's opera day and Mister Rogers arrives with a picture book showing pictures of what viewers will see in the opera -- All in the Laundry. The opera opens at the Latrobe Laundry and Dry Cleaning Company where the owner, Alice Claire (Lady Elaine Fairchilde), is giving orders to her employee, Gillespie (Reardon). Clearly overworked, Gillespie resents his overbearing boss. Phillip Photographer (Francois Clemmons) arrives with some pictures he has just taken at a handball-football game between Ito (Yoshi Ito) and Brockett (Chef Brockett). As Gillespie goes back to work, Phillip snaps a photograph of him; however, the photo shows only his back. Outside the store, Phillip greets Miss Morgan (Lady Aberlin) -- a rich woman looking to spend her money on everything from diamonds to an apartment house. Catching a glimpse of Phillip's picture of Gillepsie, Miss Morgan immediately labels Gillespie as the man of her dreams. On the handball-football court, Ito and Brockett are involved in a friendly game as Miss Morgan arrives with the picture of Gillespie. She shares with the players that she will buy and apartment house and then continue looking for the man in the picture. As Ito and Brockett realize that their gloves and shoes are dirty from playing handball-football, Phillip informs them that they can be cleaned by the LLDCC. Back at the LLDCC, the apartment house owner (X the Owl) arrives demanding his laundry. He shares a photograph of the wealthy woman who will be buying his apartment house. Gillespie stands gazing at the photograph, distracted from the work demands of Alice Claire. The handball-football players arrive and recognize Gillespie from his photograph. At the apartment house, Miss Morgan is greeted by the owner who sells her a diamond. Unfortunately, the apartment house is not ready to be sold as the linens are still being cleaned at the LLDCC. Seeing a picture of the apartment house taken by Phillip, Miss Morgan agrees to buy the building on good faith that the linens will soon be ready. At the LLDCC, Gillespie has just finished his work for the apartment house and Mr. McFeely rushes off with the completed order. As he leaves, Miss Morgan arrives with the handball-football players. She is thrilled to find Gillespie working behind the counter and they immediately fall in love. A stack of money for Alice Claire changes ownership of the LLDCC to Miss Morgan who is happy to continue the business -- side by side with the man of her dreams. The opera concludes as Miss Paulificate, their first customer, drops off her laundry to be cleaned. 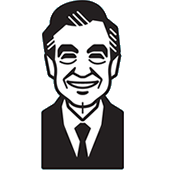 Back at the house, Mister Rogers encourages viewers to be creative by singing their thoughts. 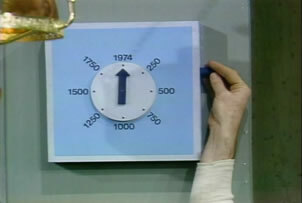 The timer used by Gillespie counts down from 1974. This episode originally aired in 1974.